DAVIDSON HAS NO PROBLEM BEING "OLD SCHOOL"
Being A Senior Member Of USRA Doesn't Mean He's "Over The Hill"
At age 53, Greg Davidson of Pearland (TX) – along with Tom Grothues – represents the “Old School” contingency of the 2005 United States Racing Association (USRA) Super Late Models series. Davidson has felt pretty good during a very well-rounded driving career. He won the Myers Speedway (Houston) track championship his first year out, in what Davidson called “a street stock class,” back in 1976. The well-traveled veteran has also driven in the All-American 400 in Nashville, the All-Pro South series, the TIDA (TX) Late Model series, and the ROMCO series. He’s been a local driver at several different tracks as well, including San Antonio Speedway. 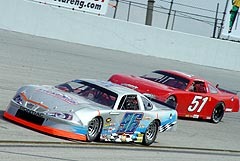 Davidson will drive the #96 Chevy Monte Carlo in the SLM series of USRA (formerly ROMCO) this coming season. Among Davidson’s expected competitors is his 27-year-old son, Chris. 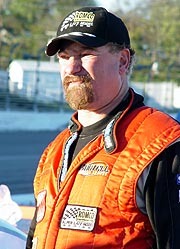 The elder Davidson chuckles at the thought of racing against his son and other “young guns” in the Super Late Model series (to date, there are 15 registered drivers in the series who are age 30 or younger). Davidson has taken steps to be in great physical shape – in fact, the best shape of his life. “I get out to the gym as much as I can,” said the former ROMCO champion. “I work on the Stairmaster and work on my upper body a lot. Davidson, who’s supported by his wife (Peggy), Chris and their daughter Heather, feels USRA has the right blueprint for future success. Davidson will have run one race (the March 19th season-opener at Houston Motorsports Park) when he’s expected to feel even “older.” That because his daughter, Heather, is expected to give birth to his first grandchild – a boy – with her due date being March 31. Heather is married to another USRA SLM driver – Ralph Burris. Davidson is ready to bring racing to the next generation of his family. “I’ve already got a go-kart built for the boy,” he declared with a smile. Greg Davidison (#96) will be the senior member of this year's USRA Series.